We meet at West Hampstead station after work and we’re both wearing coats, which I’m not alright with. One coat could be an accident. Two coats is a sign you can’t ignore. A sign it’s autumn. I love autumn, but not yet. It’s too early for it to be the end of barbeque season, or summery nights in beer gardens and on balconies. We’re not ready to be starting this evening under the shadow of early darkness, with the chill of the air curling around your wrists, collarbone and everywhere your coat doesn’t cover. But alright. If there’s an alchemy of things which could make me ready to embrace autumn it’s likely to include a night in, a fireplace and a film. And some meat. So here we are, arriving under darkening skies at the Hampstead Butcher & Providore’s shop front in West Hampstead. This is a warm, friendly shop full of incredible meat so obviously, I want to live here. And that’s the danger of doing this in person rather than using their delivery service: it takes us a lot longer to leave than it actually should. We both think we’re here to collect a pre-ordered cut of meat – the prime-aged côte de boeuf, one of their recommended ready-to-cook dinners for two – but leave a lot more weighed down with their wild boar sausages and diced lamb, with cans of pale ale and tiny sticks of salami than we’d meant to be. Back at Joseph’s, what we do in the way of preparation is: not much. Open a honey beer, leave the meat out on the side for a couple of hours to come to room temperature, pad about the living room choosing films to watch. In a division of labour according to Marxist principles of From Each According to Ability, Joseph brings in the logs for the fire, builds the fire and tends the fire to a steady crackle, and I lie on the floorboards in front of the fire warming myself till the cold outside feels like a fiction. And we cover the week gone and the week to come. We talk new Planet Earth and old Planet Earth, we talk best fictional robots and Bermudan weather systems. You know, all the important stuff that you can’t cover if you’re trying to coax a souffle into being or demi-glace a pork chop. 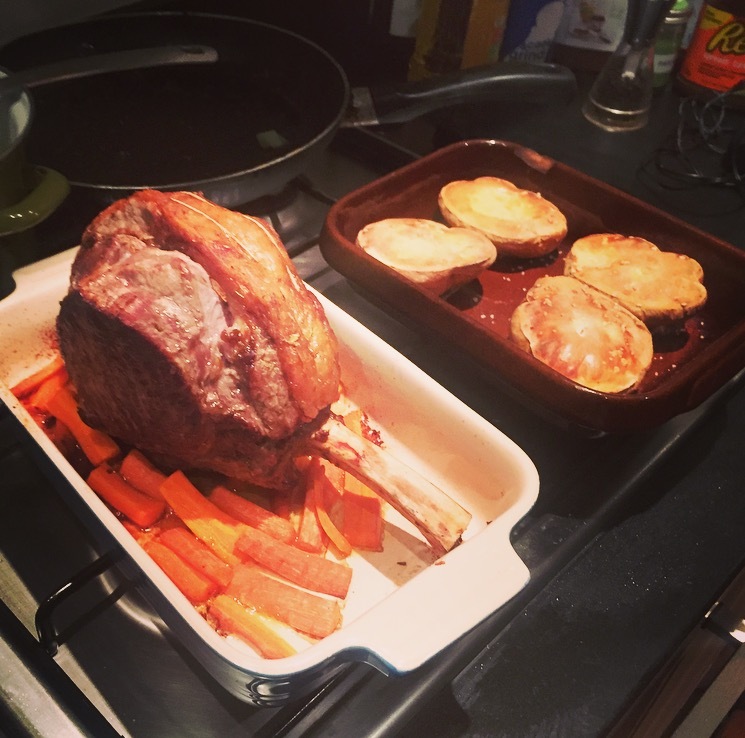 And that’s the beauty of the Hampstead Butcher’s dinners for two. 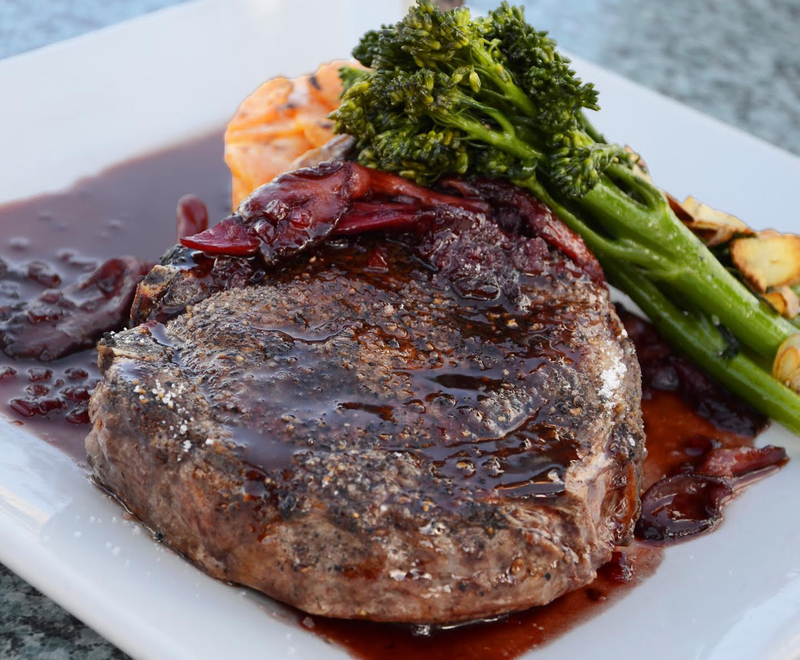 Among other things, they also offer freshly-prepared Beef Wellingtons and Blythburgh pork fillets wrapped in pesto and Parma ham – and none of them should take you away from your date night for longer than you’d be willing to spend chopping some carrots or kissing a bit in front of an oven. If you have a fireplace, start it now. If you had to wear a coat to work, it’s autumn and autumn owes you a wood-burning stove and the smell of October filling the flat. 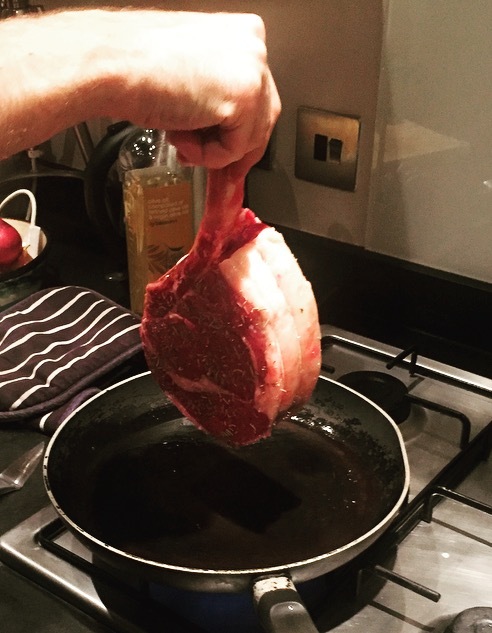 Take the côte de boeuf out of the fridge far enough ahead of cooking to get it to room temperature. This isn’t really meat for roasting, this is just meat that wants the quick, hot kiss of an oven and to be left as rare as you can handle. So we give the potatoes twenty minutes’ head start, cut in half lengthways, rub them with salt and oil and lie them skin-down in an oven dish. Carrots and leeks can be started at the same time as the meat. Season and oil the meat, and sear in a hot frying pan on both sides for just long enough for the outside to darken. Transfer to a heated ovenproof dish and cook at about 180°C, checking after ten minutes. Pull it out while it’s still very, very rare and let it sit for a few minutes. Serve in front of your first log fire this side of summer. And serve with something simple and pure at heart, like an American basketball film, one where the coach really believes in these kids when nobody else does. For drink-matching, try it with a golden or darker ale that tastes like Bonfire Night, or the sort of fierce red wine that people talk about like it’s an untamed horse. Try Wild Beer’s Redwood for the former, or a Zuccardi estate Malbec. And serve with sides that feel autumnal. We go with carrots, roasted in the same dish as the meat. Leeks, lightly cooked and buttered less lightly, black pepper ground over them when they’ve already melted the butter to a soft glaze. The potatoes, taken out of the oven when the surfaces have turned into potato crackling and the insides are soft and hot. Later, when we’re stretching out across the sofa and the end credits of the basketball film have been and gone, Joseph describes it as the sort of food that, when it’s ready and in front of you, silences everybody while they eat. It’s true. As half of the silence in the room tonight, I’d label it as 10% awe, 40% intense concentration and 50% contentment. 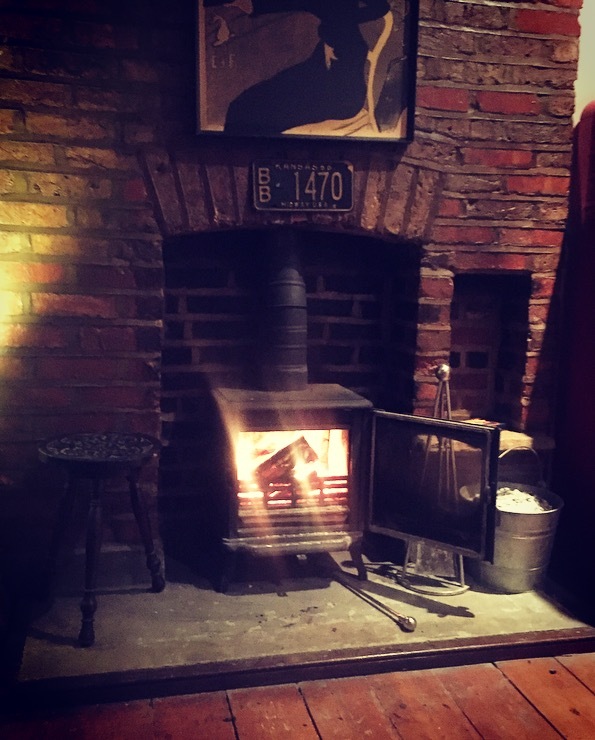 It’s hard not to be contented, when the meat’s tender and the fire’s smouldering and the room smells of woodsmoke and steak. And yeah. I guess I could get on board with autumn. 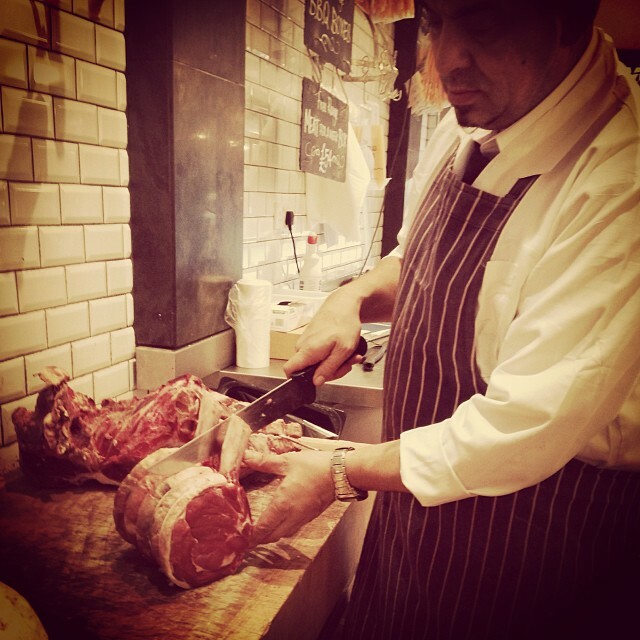 The Prime-Aged Côte de Boeuf for two (£25.95 for a 900g cut of beef) is one of the Hampstead Butcher & Providore’s selection of romantic dinners for two – the range includes a Beef Wellington and a rack of herb-crusted, free range lamb. 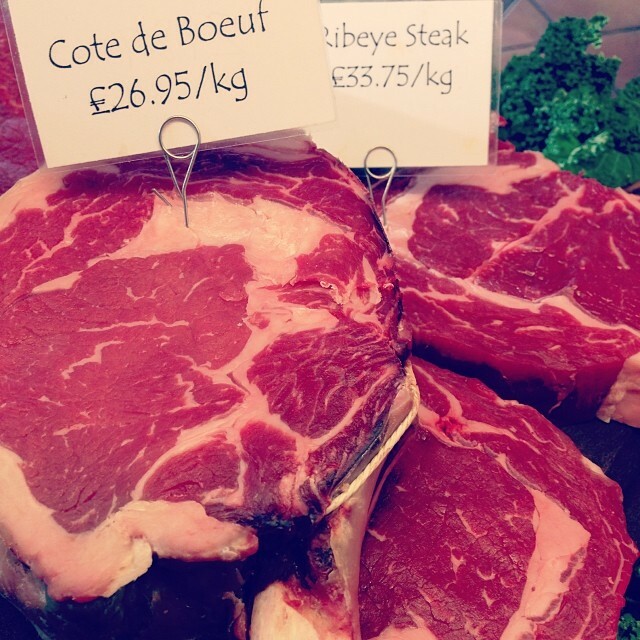 For more recipe ideas visit their site – http://www.hampsteadbutcher.com/blog – or talk to staff at either shop. 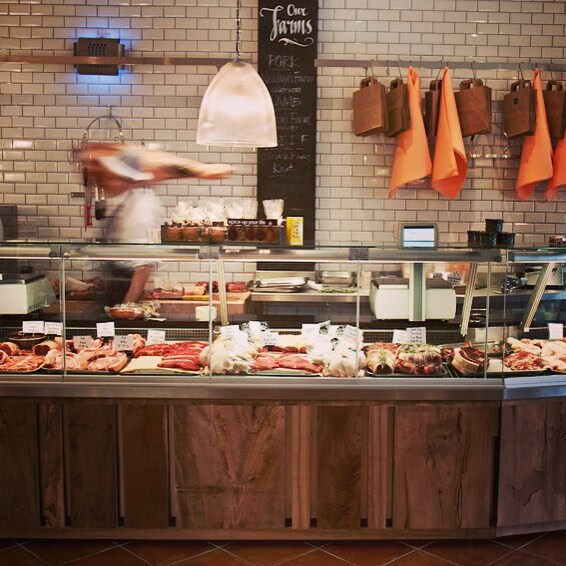 The Hampstead Butcher & Providore, 56, Rosslyn Hill, Hampstead, NW3 1ND and 244, West End Lane, West Hampstead, NW6 1LG. For orders and enquiries please call 0207 7940096. Website.